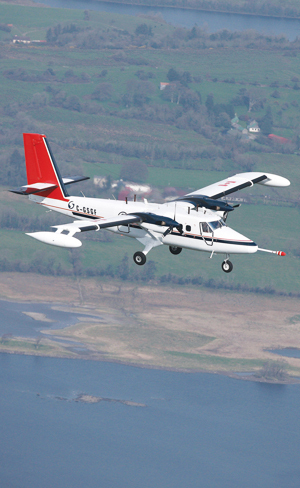 During the Tellus Project, the survey plane flew survey lines across the six counties for a total distance of 63,000 kilometers. Tellus Border, an ambitious project that surveyed the rocks, soil, and water in six border counties in the Republic of Ireland between 2011 and 2012, will help environmental management and support sustainable development of natural resources. GIS was used to plan and manage the survey and map as well as make survey data available once the survey was complete. Data from the six counties—Donegal, Sligo, Leitrim, Cavan, Monaghan, and Louth—combined with data collected during a previous project in Northern Ireland has created the first ever cross-border environmental maps. The five million euro mapping project was funded jointly by the European Union (EU); the Department of Environment, Community and Local Government in the Republic of Ireland; and the Department of the Environment in Northern Ireland. A true cross-border initiative, it is being carried out by representatives from the Geological Survey of Ireland, the Geological Survey of Northern Ireland, Queen's University Belfast, and Dundalk Institute of Technology. The project's leaders realized that GIS would play a vital role and used Esri software owned by the Department of Communications, Energy and Natural Resources (DCENR) in the Republic of Ireland. The team used ArcGIS for Desktop and ArcGIS for Server throughout the project. The project team had to plan data collection for an area of more than 12,000 square kilometers (km2) and identify 3,500 sites for soil, water, sediment, and vegetation samples. GIS was used to plan the sites of the soil and water survey points so that truly representative samples, evenly spread across all six counties, could be obtained. 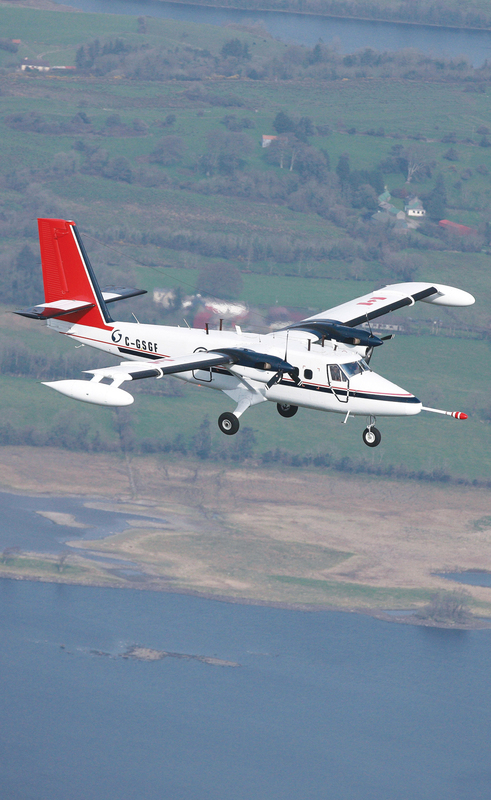 The project would require the survey plane to fly lines across the six counties for a total distance of 63,000 km (or the equivalent of one and a half times around the world). Also, landowners had to be notified when the survey plane would fly over their properties so that livestock that might be distressed by the noise could be moved. "GIS was vitally important in helping us to see which landowners to contact and when," said Shane Carey, GIS and data manager for the Tellus Border project. 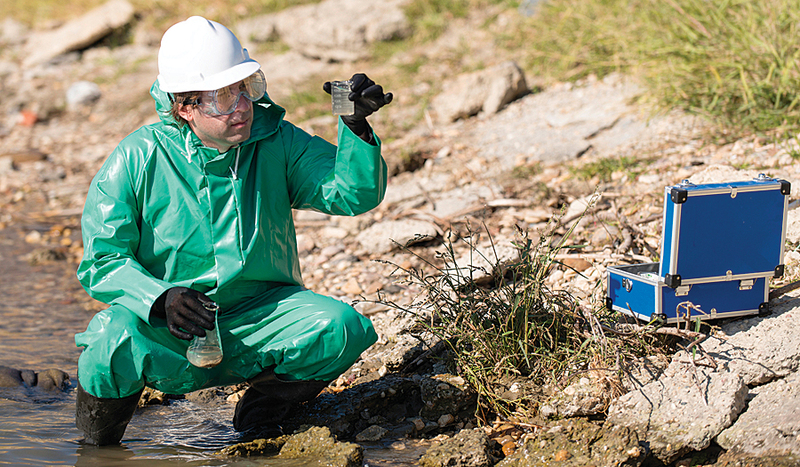 Soil, stream water, and stream sediments for more than 50 geochemical elements were collected. When the survey was completed, ArcGIS was used to make sense of the huge volumes of data and present information visually on maps, a format that was easily interpreted. "ArcGIS enabled us to stitch together data from Northern Ireland and the Republic of Ireland and create a true cross-border resource," said Mairéad Glennon, the assistant project manager. This data also needed to be collated and analyzed. The team collected over 50 million geophysical measurements from both airborne survey and land sampling. They also analyzed soil, stream water, and stream sediments for more than 50 geochemical elements, which resulted in 750,000 geochemical analyses. This information had to be interpreted and presented in a meaningful way so it could be used by a wide range of organizations. A pivotal part of the Tellus Border project was development of an online GIS viewer capable of displaying all of the survey results on interactive maps. The team used the ArcGIS Viewer for Flex app for this viewer. DCENR developer Steve O'Brien also created customized tools such as a 3D viewer using Away3D (an open-source, real- time 3D engine for the Flash platform). Anyone—government agencies, commercial businesses, research groups, environmental organizations, landowners, and the public—can use this web viewer for free to view the geophysical and geochemical maps along with a digital terrain model and basemap. Data is also available as a Web Map Service (WMS) through a REST endpoint and as downloadable Microsoft Excel, KML for Google Earth, and ArcGIS raster files. Maps and data are available at www.tellusborder.eu. 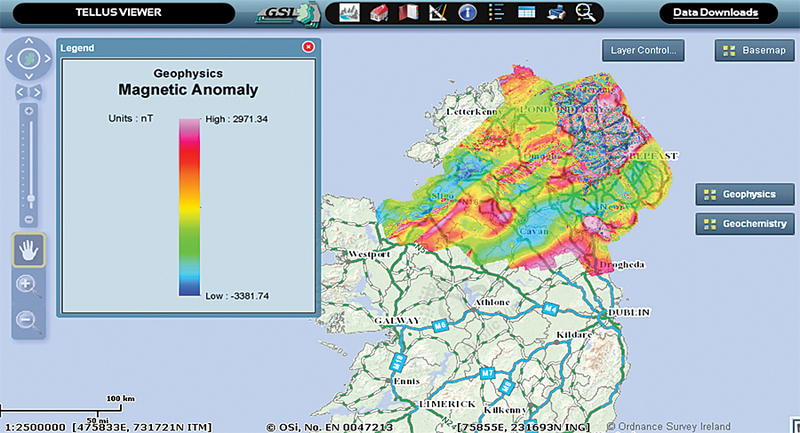 Tellus Viewer, the online GIS viewer developed by project staff, displays survey results in interactive maps. Now, the Tellus Border data is being employed in a myriad of ways to improve the management of the environment and the development of agriculture. For example, farmers can use the survey information to see the chemical status of their land and make decisions about suitable supplements for crops and livestock. By correcting trace element deficiencies and excesses in their soil, they have the potential to increase yields. Prospecting companies are using the Tellus Border data to help them identify the locations of potentially valuable mineral deposits. There has been a marked increase in the number of exploration licenses granted in the region since the project began and, if successful, these mining activities could provide a welcome boost to local and national economies. 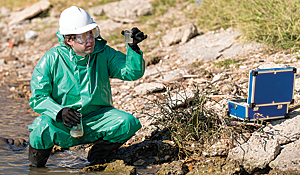 Data from the Tellus Border project is also expected to help improve public health initiatives. 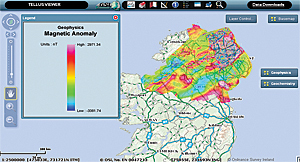 Tellus Border is working with the Radiological Protection Institute of Ireland to increase the accuracy of radon risk maps using the new airborne geophysical information. The new maps will assist in the management of high radon risk areas and help protect the public from the naturally occurring gas. "Being able to present our data online in a map-based format makes it accessible and meaningful for many different groups of people," said Glennon.